Lee Accepts Trade to the Braves. Fans Try To Do the Same. ‘The D-Lee News’ is closing it’s doors forever. A favorite feature of Prose and Ivy since I launched the site in 2007, The D-Lee News segment in the side column (scroll down to get to it) will be retired after the 2010 baseball season. Today it was announced that Derrek Lee has been traded to the Atlanta Braves for three young pitching prospects. I thought Lee was going to end up being one of the toughest calls for Ricketts/Hendry to make this off-season. Apparently, the decision was to let a class act go, but not for nothing. Listed below is a review of his career up to this point, including a solid stint leading the Cubs to multiple division titles and landing himself one NL Batting title. Right below the graphic summarizing his career is everything that’s been posted on my D-Lee News segment here on Prose and Ivy. Again, the D-Lee News will not exist as a feature on Prose and Ivy following the end of the regular season. @proseandivy Goodbye Derrek Lee, you’ll be missed. Good guy, all class. Feel free to win it this year because NEXT YEAR, is all our’s. Every regular season we’ll be keeping tabs on one guy who MUST perform up to expectations for the Cubs to continue repeating in the Central Division and hopefully finally make a run through October! Lee’s current 2010 stats: 16 HR, 56 RBI, .335 OBP, .416 SLG AND .251 AVG. Lee’s 2009 stats: .309 AVG, .395 OBP, .585 SLG, 35 HR, 111 RBI, 1 Baby. First time since 2005 Lee puts up 30 or more HR’s in a season. Lee was one of the biggest reasons the team had their best April in 2008, hit 10,000 wins all-time, had a 55-26 record at Wrigley, captured the NL Central Division crown for the second year in a row…and really the only reason we stayed in playoff contention as long as we did in 2009!!! Lee’s final stats for 2008 (for those that are interested): .291 AVG, .462 SLG%, .361 OBP, 20 HR, 90 RBI. Of course, 2008 didn’t turn out the way Lee or anyone else would’ve liked…nor did 2009 for that matter. Here’s to a horrible Spring once again in 2010, a great regular season and a postseason with a happy ending to report in the D-Lee News of October 2010!! For you stat guys/girls out there, his final 2009 Spring stats: 19-for-58, 5BB, 9SO, .369 OBP, .458 SLG, .322 AVG. Can’t wait for Spring to get here!!! Go Cubs Go!!! 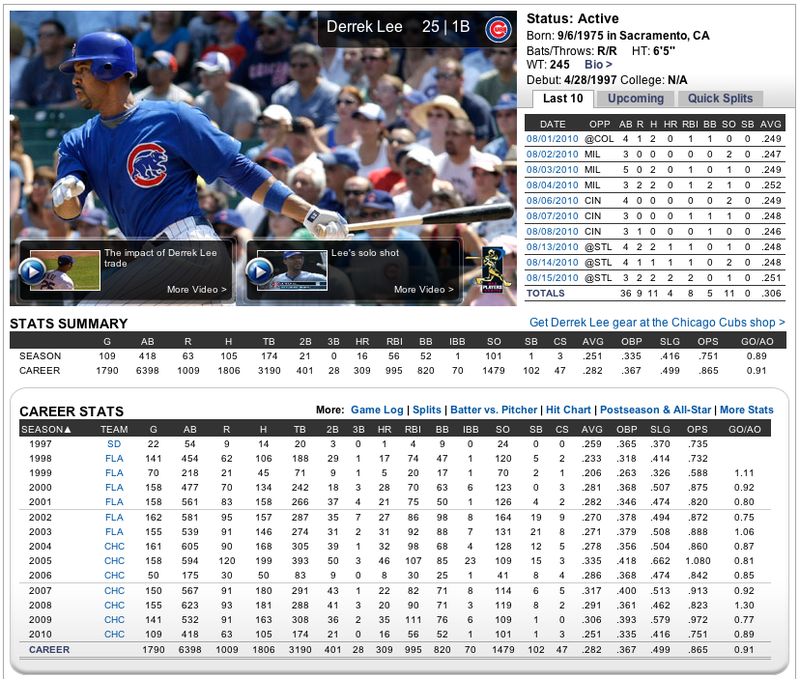 UPDATED: Lee’s horrendous 2010 Spring stats: 7-for-40; 3 HR; 9 RBI; 8 BB; 11 SO; .294 OBP; .450 SLG and a scary .175 AVG. 2010 should be great.